Exemplifying true swim style with its signature control and support, Magicsuit Swimwear delivers the ultimate in fit, form and flattering function. Featuring a dazzling assortment of slimming, sophisticated swimsuits, Magicsuit proudly offers one-pieces, tankini tops and swim bottoms all designed with our unique, comfortable fabric. Shop Magicsuit’s collection of New Arrivals you’ll only find here, all created to fit your specific shape while showing off instant confidence. Get obsessed with the beautiful and on-trend curated collection of what we’re thrilled to call our best. Magicsuit’s darling Best Sellers are sure to please your shape, style and every curve in between. Ultra-flattering One-Pieces, Bandeaus, Swimdresses and Tankini Tops are the stand-out stunners we can’t live without – and you certainly shouldn’t either! Look 10 lbs Lighter in 10 Seconds™.. Setting the ultimate standard for slimming swimwear, Miraclesuit® goes a step above to offer you the finest quality, most comfortably fitting one-pieces, separates and cover-ups. Designed exclusively with your shape in mind, Miraclesuit® slimming swimsuits shine beyond the rest and leave you trimmed, toned and totally confident. A stunning selection of separates include flowy fabrics, trysted side ties and so much more. Adjustable shoulder straps and halter necklines offer the ultimate control while shirred midsections flatter your figure. Minimize the backside and show off your glamorous gams in Magicsuit’s striking collection of Swim Bottoms, all perfectly matching our tankini tops. Designed to properly enhance the bust and provide all day support and comfort, Magicsuit’s collection of DD-Cup Swimwear offers all that and more. Flatter your figure in comfortable underwire and adjustable, smooth shoulder straps. High neck styles and unique back designs offer even more support for a lasting, true to form fit. Magicsuit’s ever-expanding medley of Plus-Size Swimwear keeps your unique shape in mind as each piece distinctively offers appropriate, full body control and instant flattering appeal. Unique necklines and tantalizing prints keep your torso trimmed. Available in both classic one-piece styles as well as tankini tops and bottoms, these signature styles offer you undeniable appeal. 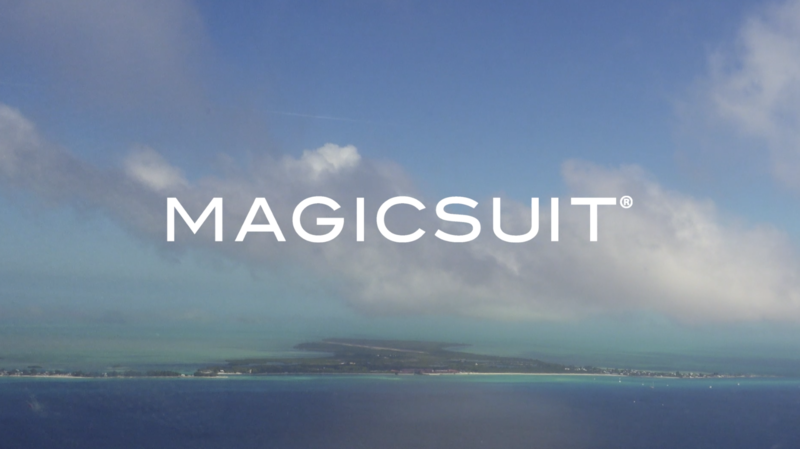 Magicsuit combines supreme slimming fabric with stylish and flattering fashion for an unbeatable swimwear package. Discover your new best bathing suit, and choose from a variety of slimming one piece swimsuits, flattering tankinis, and high waisted swim bottoms. Magicsuit tummy control swimwear delivers the best in fit, form, and function. You’ll get a perfectly flattering fit built to last. Find gorgeous swimsuits made to look good on all women. At Magicsuit we believe that all women deserve to feel beautiful in whatever swimsuit they choose. Get a swimsuit that is made to handle anything and keep you looking your very best. The options are endless at Magicsuit. Magicsuit’s line of slimming swimwear is full of gorgeous swimsuits, made to fit and flatter all women. There are plenty of styles to choose from, so you’ll be sure to find a swimsuit that is right for you in these three categories. One Piece Swimsuits: If you’re looking for tummy control, these slimming one piece swimsuits are the solution. With incredible shaping fabric, and subtle, sleek style, these cute one piece bathing suits will draw all the attention to you. Tankini Top: For some women, a two piece swimsuit can be a daunting thing. But with Magicsuit tankini tops, you can have the confidence and coverage you want to rock your own flattering two piece swimwear look. High Waist Swim Bottoms: Make your next fashion statement with a high waist swim bottom. These flattering swim bottoms are back in style for a reason: they look great on everyone. Show off your curves with these slimming swim bottoms.